Who are the major players? What do you have to read? Your questions are answered here! War of the Realms, the epic comic event coming to Marvel this April, has been ramping up for months. Now that we’re getting even closer to the big debut, you might want to know what you need to know before the War of the Realms begins. On a recent episode of This Week in Marvel, Ryan “Agent M” Penagos picked the brain of Marvel editor Wil Moss to get the lowdown on what’s happening with all Ten Realms and all the Marvel characters involved. What is the War of the Realms? “War of the Realms is this big, big Marvel universe story involving all the heroes from the Avengers, the Fantastic Four, Wolverine, the whole line. It spins out of Jason Aaron’s run on THOR but it’s still very much a Marvel universe event. Malekith, the King of the Dark Elves, has been out there conquering the Ten Realms, and Earth, aka Midgard, is the last one. So War of the Realms is about Malekith and the Dark Elves, Frost Giants, Fire Goblins coming to Earth, and the heroes having to try to fight them off. What are the Ten Realms? In the Marvel Universe, the Ten Realms are Alfheim, Asgard, Vanaheim, Jotunheim, Nidavellir, Svartalfheim, Niffleheim, Muspelheim, Midgard (Earth), and Heven. For long-time Marvel fans, Heven is not a realm in traditional Asgardian Norse mythology – however, Moss explained that in recent years, Heven was revealed to be one of the Ten Realms once upon a time. Where do the Ten Realms stand as of right now? At this point all but Midgard have fallen to Malekith’s forces, with Niffleheim holding on. 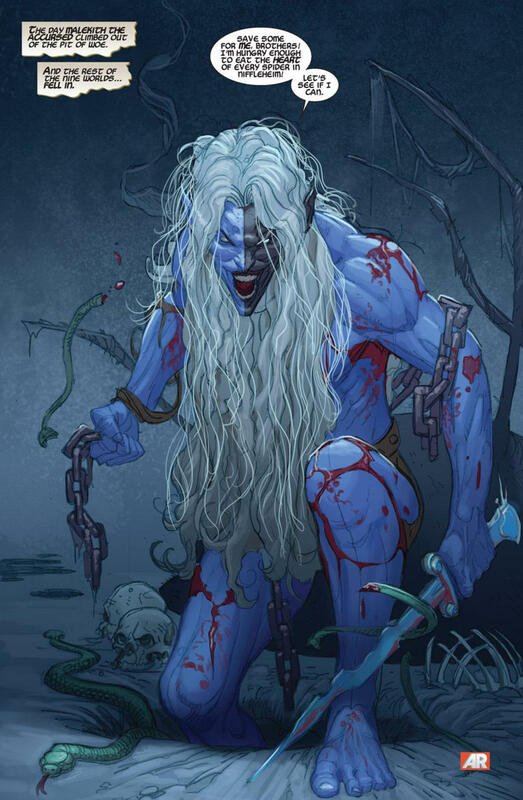 Malekith is no stranger to the Marvel Universe – and he will be the main antagonist in the War of the Realms. Malekith’s first appearance was in THOR #344 (1984), written by Walter Simonson, though according to Ryan, “we do get a hint of him in issue #341. THOR #345-348 is the saga of the casket of ancient winters, during which Malekith blankets the planet in ice; his initial story wraps up around issue #368, after which he made sporadic appearance. Another important character in War of the Realms is Kurse. 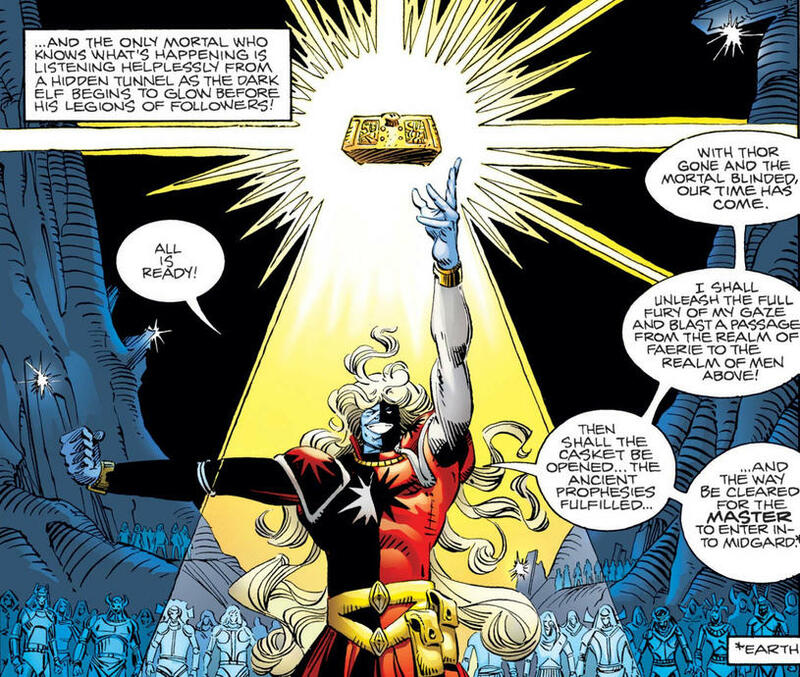 Other Malekith stories from the late ‘90s include THOR #29 (1998) written by Dan Jurgens with art by Andy Kubert. But Malekith’s most important arc appears in THOR: GOD OF THUNDER #13 from 2013, written by Jason Aaron with art by Ron Garney. What other issues are part of the lead-up to the War of the Realms? In 2015’s MIGHTY THOR #1, a disturbing panel of one of Alfheim’s Light Elves floating in space, dead, with the phrase “So begins the War of the Realms” carved into his torso. This series was created by the team driving the War of the Realms: writer Jason Aaron and artists Russell Dauterman and Matt Wilson. How is Malekith waging this massive war? The Dark Elf can also boast the Light Elf realm of Alfheim, the Fire Goblins of Muspelheim (led by Surtur’s daughter Sindr), Nornheim’s Rock Trolls (led by King Ulik), Heven and its angels, and on Earth, he’s gained an ally in Dario Agger, the head of Roxxon. Malekith also enjoys support from Enchantress and Loki – whose father is Laufey – as well as his own War Witches, who serve as advisors. Who is trying to stop Malekith? Which Marvel heroes can we expect to see? 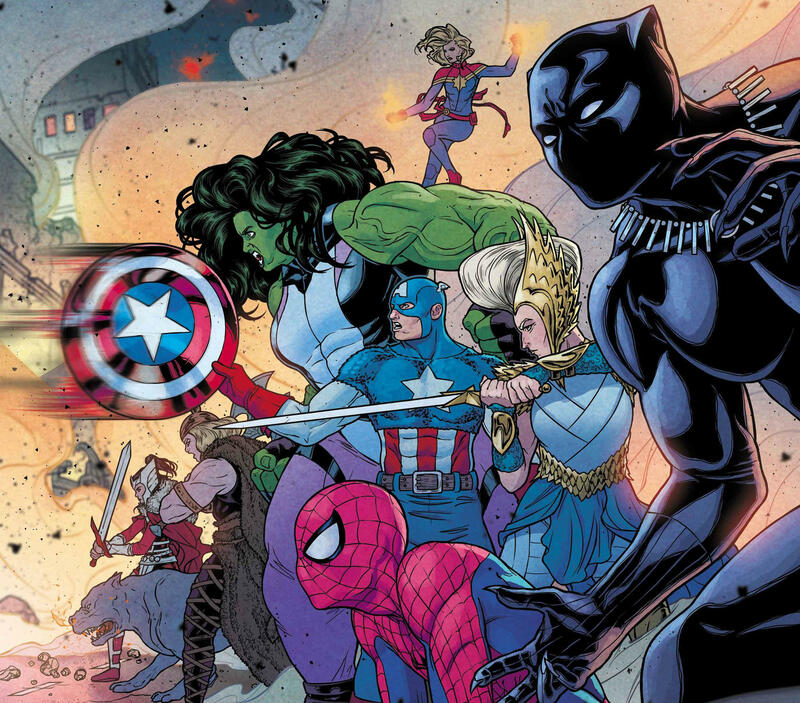 While this is a big story for Asgardians, many Marvel heroes will be playing important roles in the War of the Realms. What about the Rainbow Bridge, which was destroyed during the Death of the Mighty Thor? The destruction of the Rainbow Bridge when it was shattered by Mangog was a big blow to Thor, preventing Thor from traveling from realm to realm to try to stop Malekith any further. Malekith, however, has a dark version – the Black Bifrost – which allows him to go where he needs and wants to go. What is Thor’s status as we approach the War of the Realms? What about Jane Foster’s role? What other members of Thor’s family will we see? Thor’s sister Angela, currently with the Asgardians of the Galaxy, will also be seen on the battlefront. What do we need to read before War of the Realms? But remember -- the big event has yet to begin! Stay tuned to Marvel.com for more about War of the Realms, coming this April!